The E7K1 was a three-seat, single engine biplane on twin floats used by the Japanese Navy from 1934 through WW2. The aircraft was constructed of welded copper/steel tubing, covered with fabric. The aircraft was powered by a 12 cyclinder, 600 hp V-12 engine. The floats were of a tough all-metal construction, which allowed it to operate in fairly rough water. The aircraft was used aboard battleships and cruisers, and could also be based on small islands, supported by a seaplane tender. The kit consists of 85 parts, molded in light gray. 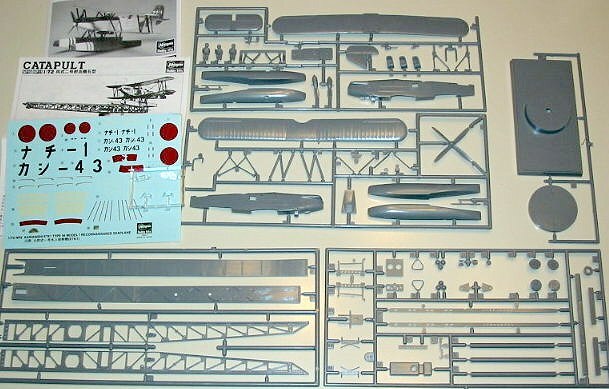 If you look at the picture, you’ll see that only two of the five sprues are for the aircraft—the other three are for the catapult. The surfaces have fine raised panel lines and rivet detail. My kit was well molded, with only a little bit of flash on some of the mold lines, such as the wingtips. The kit includes three aircrew figures. The cockpit detail consists of three seats, and a floor, and that’s it. However, the cockpits are deep and the openings are fairly small, so if you use the chunky pilot figures, you won’t be able to see much anyways. The wings are one piece, with fine molded rib details. The N struts are molded as one piece, and look like they’ll be reasonably easy to install. The fuselage is fairly simple, with very few detail parts. This really is a simple kit. The instructions are the standard Hasegawa pictorial style. The 8 steps to assemble the model are well laid out. Two of the pages are devoted to 4-views of the two marking options, showing colors and decal placements. Colors are called out by name, with numbers for Gunze-Sangyo and Mr. Color. An aircraft attached to the ship Nachi. An aircraft attached to the Kashima Air Group. Oddly enough, the model does not include the markings for the aircraft on the box top. The model shown on the box top is finished in standard dark green over gray. The Kashima aircraft is very plain, with the entire aircraft in silver, except for the markings. The catapult is a Type 2-5 gunpowder propelled catapult, used on many IJN cruisers and battleships. It was 19 meters long, and was used to launch the Type 94 biplane (Alf) and the Type 0 Monplane (Pete) aircraft. The catapult has a separate instruction sheet, with a history, pictorial assembly instructions, and finishing instructions. The instruction sheet includes diagrams showing how to use thread to rig the sled cable. The catapult is mounted on a circular base with a metal deck sort of finish. Recommended. This is a fairly simple model, but the only one of this aircraft that I am aware of. The inclusion of the catapult makes for an interesting display option. Review kit courtesy of my son, Jamie, and Father’s Day 2003.